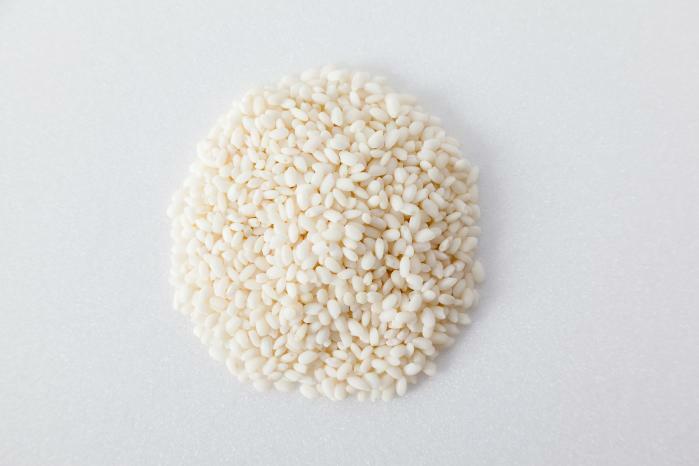 Sweet rice flour is ground from ground sweet rice, also known as glutinous rice or sticky rice. The husk, bran, and germ are removed to produce the "sticky rice." It is higher in starch content, which makes it a great thickener. The flavor is mild and it is a great gluten-free flour alternative. How To Make Your Own: Take uncooked sweet "sticky" rice, place in high output blender, food processor, or coffee grinder and grind until fine. We do our best to make sure products are gluten-free, but companies change manufacturers and we can not guarantee their product. Please contact the company directly regarding their gluten-free guarantee. Preheat oven to 350 degrees and butter or spray a 9 x 13 glass dish. Cream the butter, sugar and eggs in a bowl. Pour into glass dish and bake for 40-50 minutes. Edges should have a nice light brown color while the middle is a nice cream color. Eat hot or cold. (Optional) I like to add the shredded coconut to the batter. For the last 15 minutes of baking, I also like to take some of the shredded coconut and sprinkle it to the top of the cake to toast the coconut. Very delicious!